The authors report a case of nonconforming focal choroidal excavation (FCE) identified in an eye following blunt, nonperforating trauma to the globe. Multimodal imaging was undertaken including color fundus photographs, enhanced depth imaging optical coherence tomography, fluorescein angiography, and fundus autofluorescence. This shows that FCE may result from blunt ocular trauma. The authors hypothesize that loss of structural support provided by an intact Bruch's membrane may be a key factor in precipitating the specific morphological changes associated with FCE occurring in a range of clinical settings. Well-known retinal complications of blunt trauma include choroidal rupture, Purtscher's retinopathy, Berlin's edema, and choroidal neovascularization. We demonstrate a case of nonconforming FCE detected in a young patient that appeared to result from blunt ocular trauma. 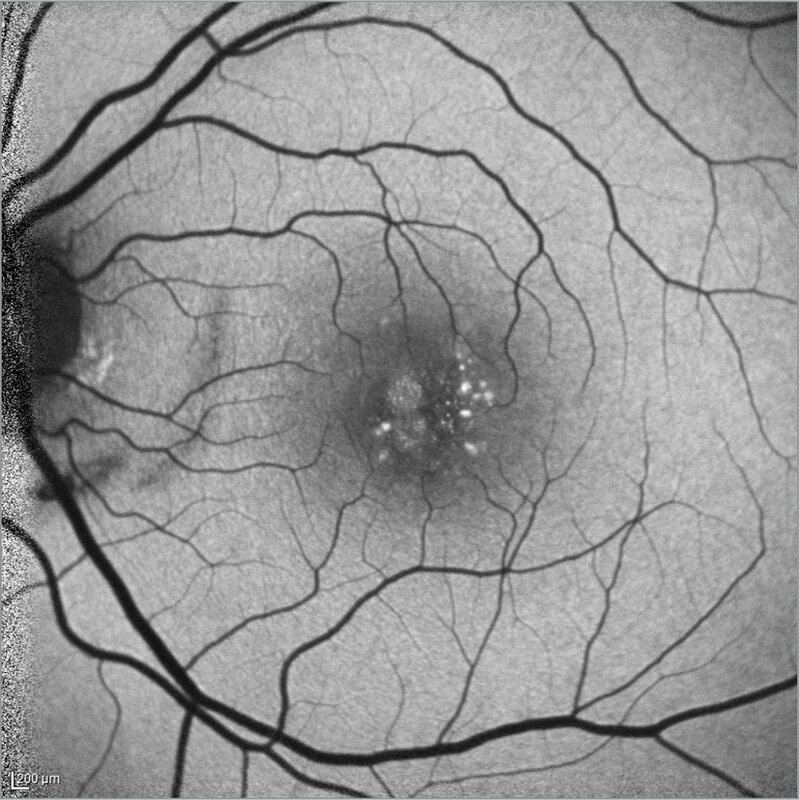 Multimodal imaging, including enhanced depth imaging optical coherence tomography (EDI OCT), fundus autofluorescence (FAF), and fluorescein angiography (FA), was used to characterize the lesion. A 32-year-old male was examined for decreased vision in his left eye. He had sustained blunt trauma to the globe without rupture during a physical altercation several months prior to presentation. His past ocular history was noncontributory. He had no significant medical problems. Slit-lamp examination of the anterior segments was unremarkable. Visual acuity was 20/20 in the right eye and hand motion at 3 feet in the left eye. Intraocular pressure was 12 mm Hg in both eyes. Funduscopic examination of the right eye revealed normal findings. In the left eye, there was a lamellar macular hole (MH) with a gray chorioretinal scar temporal to the fovea (Figure 1A). A second gray chorioretinal scar was seen in the nasal macula. FA demonstrated a crescent-shaped area of leakage in the temporal perifoveal area corresponding to the gray scar (Figure 2). 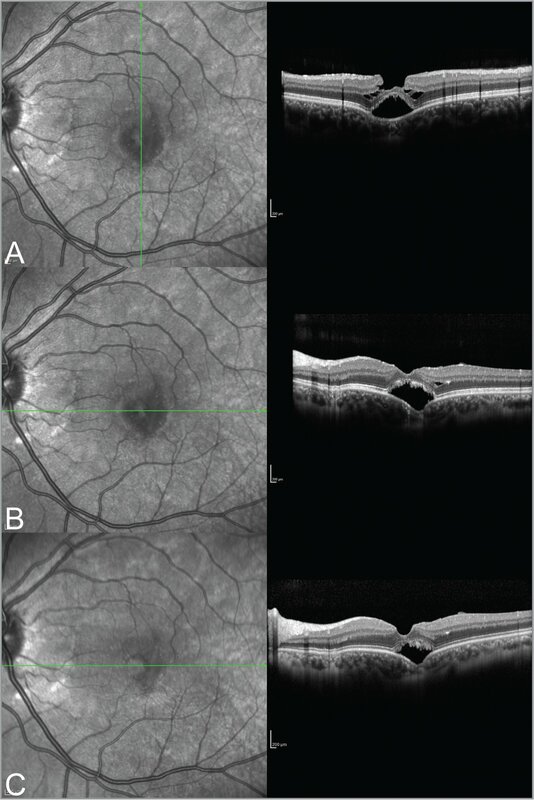 FAF demonstrated central hyperautofluorescence corresponding to the lamellar macular hole, focal hyperautofluorescent spots in the perifoveal region, and hypoautofluorescence corresponding to the nasal area of choroidal rupture (Figure 3). Enhanced depth imaging OCT (Figures 4A and 4B) demonstrated a lamellar MH overlying a nonconforming central focal choroidal excavation. The RPE / Bruch's membrane complex appeared attenuated within the area of FCE. Although thinned, the choroidal structure within the FCE appeared normal. A second area of choroidal thinning in the nasal macula corresponded to a second area of choroidal rupture. Color fundus photographs of a 32-year-old male 5 months (A) and 8 months after blunt ocular trauma. There is an inner lamellar macular hole centrally and grey crescentic scars in the parafoveal and peripapillary regions. Late arteriovenous (A: 30 seconds) and recirculation (B: 1 minute and 38 seconds) phase fluorescein angiography of the left eye at presentation show crescentic areas of hyperfluorescent staining corresponding to choroidal rupture. There is minimal dye leakage into the subretinal space overlying the nonconforming focal choroidal excavation. Fundus autofluorescence of the left eye at presentation shows areas of central hyperautofluorescence corresponding to the lamellar macular hole and focal areas of elongated photoreceptor outer segments overlying a nonconforming focal choroidal excavation. There is a crescentic area of hypoautofluorescence nasally corresponding to an area of choroidal rupture. Horizontal and vertical enhanced depth imaging optical coherence tomography (EDI OCT) images of the left eye (A, B) 1 month post-trauma shows a nonconforming central focal choroidal excavation (FCE) with an overlying lamellar macular hole and schisis within Henle's fiber layer. Although choroidal thickness within the lesion is diminished, the choroidal structure does not appear to manifest cicatricial changes. The retinal pigment epithelium / Bruch's membrane complex is attenuated within the area of FCE. Three months after blunt trauma, EDI OCT shows reduced subretinal fluid and resolution of the schisis (C). The green arrows indicate the location and direction of the EDI OCT B-scans. Three months later, the patient's vision had improved to hand motion at 9 feet in the left eye. The funduscopic findings appeared similar those seen at presentation (Figure 1B). Follow-up EDI OCT showed a persistent nonconforming FCE with a small reduction in subretinal fluid and resolution of overlying retinoschisis (Figure 4C). We present a case of nonconforming focal choroidal excavation with visual loss attributable to blunt nonpenetrating ocular trauma in a young emmetropic patient. The nonconforming FCE appeared to result from a choroidal rupture that was not associated with subretinal hemorrhage or secondary choroidal neovascularization. Focal choroidal excavation has been described in the context of pachychoroid disease such as central serous chorioretinopathy, pachychoroid neovascularization, and polypoidal choroidal vasculopathy (also known as aneurysmal type 1 neovascularization).3,7 The mechanism for FCE formation remains uncertain, and controversy persists regarding whether FCEs are congenital or acquired. Studies by Park and Oh8 demonstrate that choroidal excavations are not found in young patients without a history of inflammation or trauma, suggesting that they are an acquired condition. In our patient, the detection of FCE following choroidal rupture supports a hypothesis previously proposed by other investigators, who suggested that an intact Bruch's membrane is needed to maintain retinal layer morphology in the horizontal plane.9,10 Thus, FCE may occur following disruption of Bruch's membrane, resulting in prolapse of overlying retina posteriorly. Similar findings have been observed following resolution of inflammatory pigment epithelial detachments in multifocal choroiditis10 and other white dot syndromes.11 We have also observed smaller but similar changes following lacquer crack formation in pathological myopia and associated with defects in Bruch's membrane breaks occurring in pseudoxanthoma elasticum. In summary, we present a case of nonconforming FCE detected shortly following blunt, nonpenetrating trauma associated with choroidal rupture. We believe that focal disruption of Bruch's membrane — in particular, its elastic layer — may represent a common pathway for FCE formation in a range of clinical settings.12 If FCE are acquired lesions, longitudinal studies describing the evolution of these lesions will aid in the understanding of their pathophysiology. Nishikawa Y, Fujinami K, Watanabe K, Noda T, Tsunoda K, Akiyama K. Clinical course of focal choroidal excavation in Vogt-Koyanagi-Harada disease. Clin Ophthalmol. 2014;8:2461–2465. From Vitreous Retina Macula Consultants of New York, New York (JTM, BCSL, KBF); the Department of Ophthalmology, New York University School of Medicine, New York (JTM, BCSL, KBF); The LuEsther T. Mertz Retinal Research Center, Manhattan Eye, Ear and Throat Hospital, New York (JTM, BCSL); and Ankara Ulucanlar Eye Research Hospital, Ankara, Turkey (MYT). Supported by the Macula Foundation, New York, New York. Dr. Freund is a consultant for Optovue, Zeiss, Heidelberg Engineering, and Novartis and receives research support from Genentech / Roche. The remaining authors report no relevant financial disclosures. Address correspondence to K. Bailey Freund, MD, Vitreous Retina Macula Consultants of New York, 460 Park Ave., New York, NY 10022; email: kbfnyf@aol.com.